≪Cereus of Selene≫, because Selene was the Greek moon goddess, and the flowers of this genus open only at night. 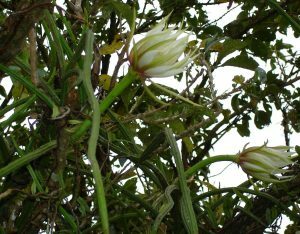 A genus of epiphytic or more often epilithic or terrestrial plants, with long and slender climbing stems, densely branched, exceeding 5 m long, finely ribbed, with aerial roots. Areoles with short hairs; spines small, setose or hairy, rarely aciculate, sometimes absent. Flowers nocturnal, self-sterile, funnel-shaped up to 40 cm long and 20 cm in diameter, inner tepals white, outer tepals yellow, pink to brownish, the pericarpel and floral tube covered with scales, hairs, bristles or spines, intensely fragrant, often smelling of vanilla, pollinated by bats (Monophyllus redmani, Phyllonycteris poeyi) and by Sphingideae. Fruits globose to oblong, fleshy, usually red, edible, hairy and with persistent spines. Seeds egg-shaped to kidney-shaped, shiny black, covered with mucilage. The genus Selenicereus has an extensive geographic range in tropical areas, and grows rather like a climbing terrestrial plant, obtaining its sustenance from the ground, using the surrounding vegetation for support, also epiphytic and pendulous, very ciose to the water, from sea level up to 2400 m in altitude. It is sometimes found in swampy areas, hanging in the trees (Pachira aquatica) and mangroves (Rhizophora mangle), together with Strophocactus testudo. San Luis Potosi, Sinaloa, Tabasco, Tamaulipas, Veracruz, Yucatan), Nicaragua (Atlantico Norte), Panama (Darien), Puerto Rico, Dominican Republic, Surinam, USA (Florida), Venezuela (Aragua, Bolivar, Carabobo, Distrito Federal, Falcon, Miranda, Monagas, Sucre, Tachira, Vargas), Virgin Islands.